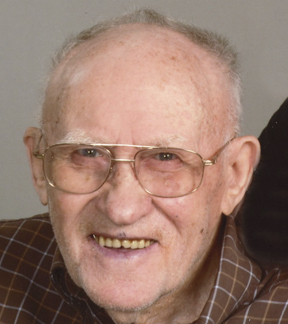 Sylvester M. Ruegemer, age 93 of Sauk Centre, passed away surrounded by family on Thursday, March 14, 2019, at the CentraCare Health Nursing Home in Sauk Centre. A Traditional Catholic Requiem Mass was held at 10 a.m. Monday, March 18 at the Patton-Schad Funeral Home in Sauk Centre. Interment was held at Calvary Cemetery near Villard. Visitation was held from 4-8 p.m. Sunday and from 9-10 a.m. Monday at the funeral home in Sauk Centre. Sylvester Martin Ruegemer was born Feb. 1, 1926, in St. Martin, to Alfred and Magdelina (Blonigen) Ruegemer. Sylvester passed on his devotion to the Blessed Virgin Mary by saying the rosary while making 14 black walnut rosaries for his children. These walnuts came from the tree he planted on the family farm. He continued passing on his devotion by making an additional 97 for his grandchildren. Survivors include his wife, Peggy Ruegemer of Sauk Centre; children, Timothy (Marion) Ruegemer of Villard, Dorine (Virgil) Laecken of Sauk Centre, Rita (Dennis) Maus of Osakis, Anne (Alphonse) Wiener of Osakis, Peter (Anita) Ruegemer of Villard, Helen (Kevin) Duchene of Villard, Teresa (Jeffrey) Baert of Foley, Joseph Ruegemer of Wheaton, Louise (Todd) Malecha of Villard, Martha (Gregory) Wiener of Sauk Centre, Paul (Michele) Ruegemer of Browerville, John (Beth) Ruegemer of Villard, Thomas (Cynthia) Ruegemer of Holdingford, Michael (Jennifer) Ruegemer of Hayden, Idaho; 97 grandchildren; over 140 great-grandchildren; and siblings, Melvin Ruegemer, Edwin Ruegemer, Lorraine Hoffman and Lawrence (Mary) Ruegemer. Sylvester was preceded in death by his first wife, Rose Mary (Massmann) Ruegemer on Sept. 15, 1986; parents, Alfred and Magdelina Ruegemer; and siblings, Virgil Ruegemer, Lorella Pundsack, Marcella Zierden and Viola Zierden. In lieu of flowers, Sylvester’s family would like rosaries and Masses to be said for the salvation of his soul.